If you’re part of the rapidly growing home-based workforce or you’d just like a designated place to pay the bills, here are some simple ways to create a home office on a budget. If you have a spare room, you’ll thank yourself later if you give it a coat of paint, window blinds, and plenty of wall-mounted adjustable shelving before you move in. Even if it’s just painted plywood on sawhorse legs, give yourself the biggest desk your floorspace will comfortably allow. 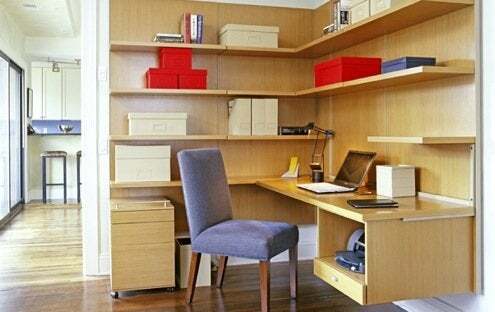 If you don’t have a spare room, five feet of wallspace can make a home office. Remove the doors from a double closet in a hallway or guest room, paint the interior your favorite color, and add a wall-mounted desk and shelves painted a contrasting color. Organizing with color is a great trick: a darker color on the back wall will make it seem deeper. Use storage boxes and magazine files in uniform colors to bring order to the chaos, and label everything so it stays neat. The most important feature of your new home office? Plenty of electrical outlets: if you need more, get an electrician to set you up before you start.